In light of the recent tragic shootings in Tucson, I am reminded again, that freedom is not free, serving is not without a price and what William Wallace said is still true today; “Everyone must die, but few people ever really live!” I read John 10:10 and I want to think it says more “comfortably” and darned if it doesn’t say “abundantly” every time. The hard part about missional leadership is that it is hard, very hard and it is not without its costs and risks. I also remember the Black and White TV on the kitchen counter that would be on when I came home from school that broadcast variety shows (not talk shows or reality shows) like The Mike Douglas Show or the Dinah Shore Show, followed by the news. However during September, the MLB playoffs and World Series would be on and be a welcome sound as I returned from school. I specifically remember the 1968 series between Bob Gibson and the Cardinals and Mickey Lolich and the Tigers … those months prior to that Series were crazy for our country. I remember seeing the news on Martin Luther King Junior’s assassination in April, RFK’s televised eulogy http://www.americanrhetoric.com/speeches/rfkonmlkdeath.html and then his own assassination in June. Even at that young age I could see the contrast between Wimpy who lived in comfort with little cost and MLK who died for something he believed in. Things that mattered seem to cost a lot. Tom Brokaw in his book The Greatest Generation — http://www.hulu.com/watch/7642/tom-brokaw-reports-the-greatest-generation described the generation of MLK, my parents age, as those who survived the Great Depression and then went on to fight for global and national justice at great cost and then rebuild our country. That Great Generation was followed by the Boomers and Busters who focused on seeking comfort more than serving others. The pendulum is swinging again and some emerging leaders are willing to risk it all for the cause of the greater good although young, are taking the causal lead. You, those Next2Lead, are the generation I am most hopeful about, born after 1990, and called by some sociologists as “The Correctors”. 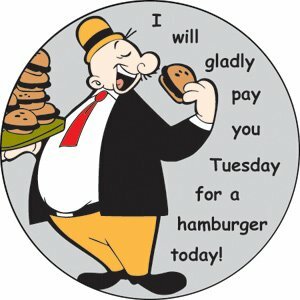 We are in an age where it is almost preferred that we pay next Tuesday for hamburgers that we had today. Heck if we buy the burger on a credit card then quickly declare bankruptcy, we would never have to pay for it! But we are also in an age, when young Christian leaders are more likely to embrace the “abundance” of John 10:10 and sacrifices to bring about the Kingdom on earth as it is in heaven … and to you, the next Great Generation I say, keep up the great work!